Share tasks in Outlook, manage teamwork and get things done with CodeTwo Public Folders. The main advantage of group work in the office is that things get done faster. In comparison to individual work, team goals are achieved quicker and projects are run with greater efficiency. To achieve this, however, groups need an effective task sharing tool. CodeTwo Public Folders enables you to manage group tasks directly in Outlook. Task sharing is not limited to just the default Tasks folder created automatically in all Outlook profiles. Our program allows you to also share any additional task folder created e.g. for a specific project. You can then share access to this folder with your co-workers, so they are able to review the task list. The task description might include such information as a detailed specification, the name of the person responsible for the completion of the task, due date, priority, percentage of completion, etc. This way, since all tasks are stored in one group folder, the manager of the project has easy access to them, can track their progress and react to the situation when necessary. When teammates are logged into the network (Internet or local), any changes made in tasks are synced immediately. This way you are sure that all the tasks are up to date. If you are offline, you still have full functionality, and the changes you make will be synced once you’re back online. TIP: If you want to hide some of your items in the shared folder from other team members, just mark them as Private. For a better experience with task sharing, including delegating ownership of tasks, setting deadline alerts, generating workflow statistics or using additional sub-statuses we advise to download our free Outlook add-in called CodeTwo Task Workflow. Use CodeTwo Public Folders to share your task folders with specific people. 1. After installing CodeTwo Public Folders, in Tasks, in your Outlook Navigation Pane, right-click a specific task folder and select Share this folder. 4. 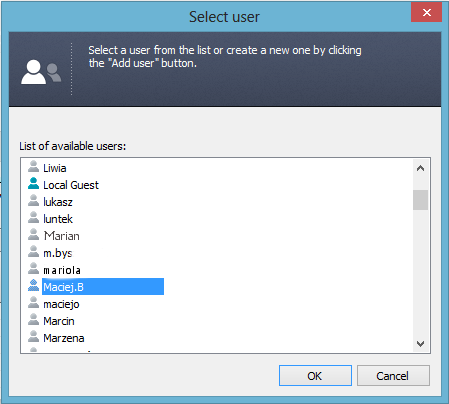 From the list in the Select user window choose the users you would like to share your task folder with and click OK.
5. 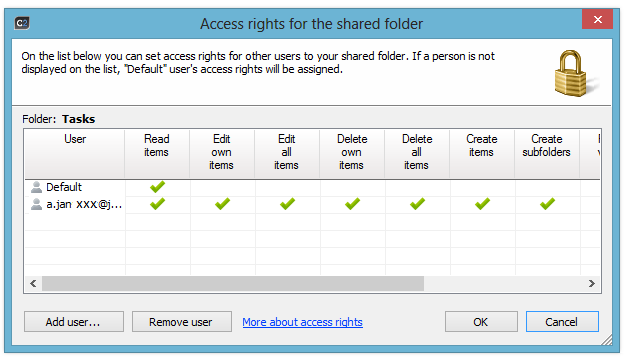 By default, the users you selected will have full access rights to the folder. 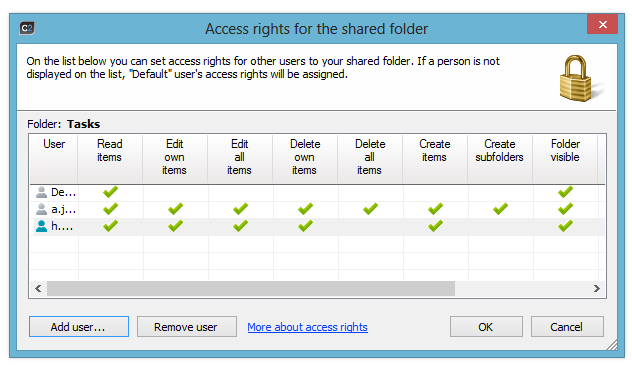 Review the users’ rights to the folder in the confirmation dialog box and then click OK. The procedure presented above is applicable to all types of folders, not only those containing tasks. The default Tasks folder in Outlook is created in every Outlook profile. This folder cannot be renamed or removed. To use custom names you need to create additional task folders. 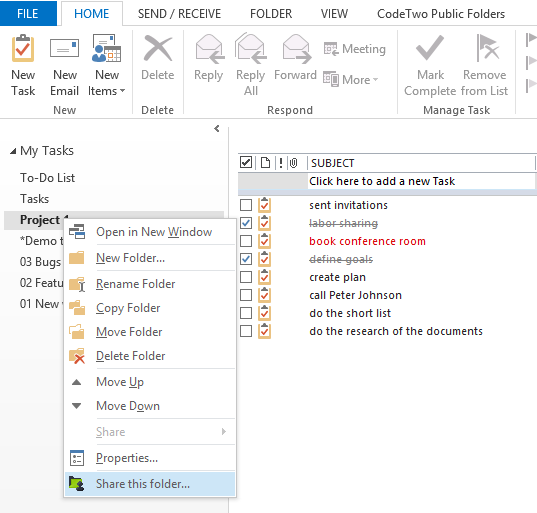 The task folder sharing function of CodeTwo Public Folders can be used to assign tasks in Outlook. All the user has to do is share the task folder with his or her supervisor. From that moment on, the manager is able to easily track the progress of a project, modify existing tasks and add new ones to the user’s personal task folder. Alternatively, a public task folder can be created to manage common tasks for the whole team.